Black and white negative showing William Albert Donnelly sitting in a chair at Whitby United Church. William Albert Donnelly was born at Cayuga, ON in 1882. He was station master at the Canadian Pacific Railway station from 1930-1937. He was the superintendent of Sunday school at Whitby United Church. He later moved to Port Hope where he served the railway at Cobourg and Tweed. Throughout his life, Donnelly served as president of the Cobourg Rotary Club and was a member of the Masonic Lodge, Oddfellows Lodge, and the Eastern Star, all in Tweed. Donnelly returned to Whitby after his retirement but died at Belleville on 28 December 1971. He is buried at Mount Lawn Cemetery in Whitby. 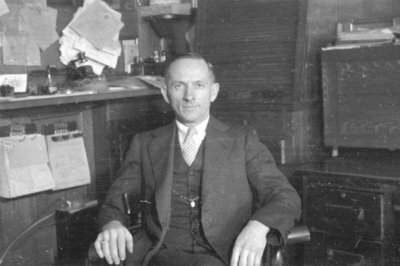 William Albert Donnelly, 1937, Marjorie Ruddy, Whitby Archives, 31-009-538.